After breakfast drive to Bundi in Rajasthan. Check at the hotel upon arrival. Afternoon visit the Tara Garh fort to discover Chhatra Mahal, Badal Mahal and Ratan Daulat - Diwan-I-Aam Also visit Naval Sagar, Manoharji ki Baori and Rani ki Baori the famous step-wells of Bundi. Dinner and overnight stay will be at the hotel. After breakfast drive to Udaipur, a beautiful oasis in desert landscape of Rajasthan, famous known as the City of Lakes and Palaces. It is also considered to be one of the most romantic cities in India and one of the best cities in the world. Check at the hotel upon arrival in Udaipur; and relax. In the evening enjoy the boat ride on the waves of majestic Pichola Lake. Dinner and overnight stay will be at the hotel. After breakfast embark on sightseeing tour of Udaipur. Major attractions include City Palace, Lake Palace, Jagmandir Palace, Jagdish Temple, Eklingji Temple, Lake Pichola, Boat Ride on Lakes, Vintage Car Gallery, Bharatiya Lok Kala Mandal, etc. Dinner and overnight will be at the hotel. After breakfast drive to Jodhpur, the second largest city of Rajasthan. Fondly known as Blue City, Jodhpur is a historical town dominated by the massive Mehrangarh fort, topping a sheer rocky ridge right in the middle of the town. On arrival, our representative will assist you to transfer you to the hotel. 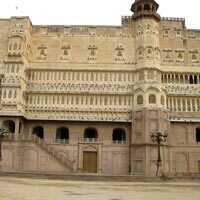 In the evening visit massive Mehrangarh Fort, the Jaswant Thada, which harbors the royal cenotaphs, built in the marble and the Mandore Gardens, a memorial for former rulers of the area. Dinner and overnight stay will be at the hotel. After breakfast drive to Jaisalmer, situated in the Thar Desert of Rajasthan and famously called the Golden City of India. On arrival, our representative will assist you to transfer you to the hotel. Freshen up and relax at the hotel. On arrival, our representative will assist you to transfer you to the hotel. Dinner and overnight stay will be at the hotel. After breakfast drive to Bikaner, Rajasthan. On arrival, our representative will transfer you to the hotel. In the afternoon, proceed for Bikaner tour. Major attractions include Junagarh Fort, Lalgarh Palace, Fort Museum and Camel Breeding Farm & Research Centre. Dinner and overnight stay will be at the hotel. After breakfast drive to Nawalgarh. 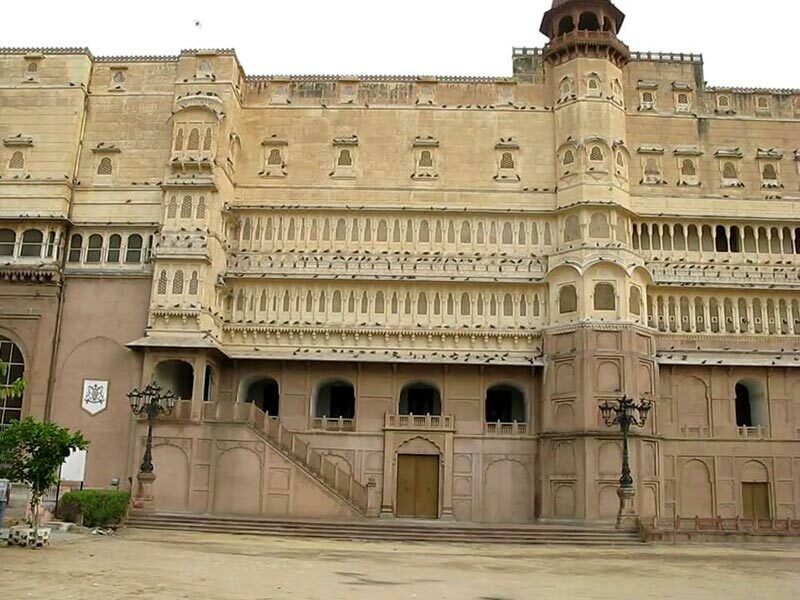 Visit Poddar Haveli, Morarka Haveli, Aath haveli & Sheesh Mahal. Later proceed towards Delhi. Our representative will drop you at New Delhi International Airport to connect the flight for onward journey with mesmerizing memory of Rajasthan forts and palaces tours in India.